“A lot better” is highly subjective. Sure enough, the #3,517 ranking of Math Jokes 4 Mathy Folks has an absolute difference of 2,893 compared to WGBSWU; or, if you’re into ratios, the rank of my book is five times as much as the rank of WGBSWU. But what does that really mean? In practical terms, it means that the number of copies of WGBSWU that will sell on Amazon this week is approximately six times the number of copies of MJ4MF that will sell during the same period. If my calculations are correct, that is. No one is really sure how ranking translates to sales, but I estimate that approximately 250 copies of MJ4MF and 1,500 copies of WGBSWU will sell this week. This is what math geeks do: We try to understand everything quantitatively. I took weekly sales data for MJ4MF and compared that with the book’s average ranking for the week. I randomly chose 20 weeks in 2012-13 for this analysis, because while pulling weekly sales data is relatively easy — it’s provided at Amazon Author Central — determining weekly average ranking is more difficult, since data has to be pulled day by day. And it’s not as simple as just exporting the data to Excel or a CSV file… the data is provided in a graph, and if you want to manipulate that data in any way, you have to look at each point on the graph, determine its value, and then enter it manually. Ugh. 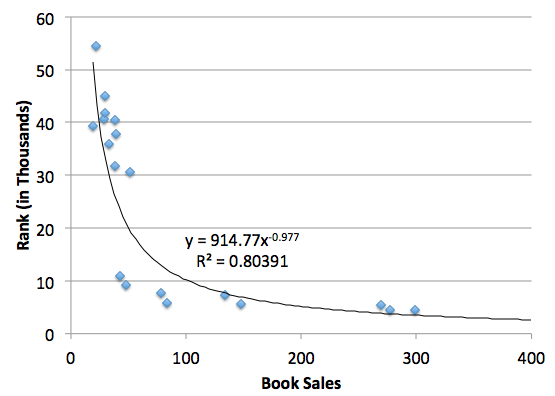 The regression equation S = 914.77 × R-0.977 gives a reasonably good fit (r = 0.89). What’s interesting is that this formula is less accurate in November and December than during the rest of year. There are two reasons for that. First, sales increase dramatically during the holiday shopping season. Second, such a formula is bound to be less accurate with larger numbers. Amazon posts sales data for each week on the following Friday. Sales data for last week won’t post until December 20. I’ll update this post on Friday and let you know how well I did. Today might be Fortune Cookie Day. Hard to say, really, because there are also plenty of references on the web that claim July 20 is Fortune Cookie Day, and the good folks at Holiday Insights claim that there are references to a Fortune Cookie Day in April, May and June, too. But honestly, who cares? No one should lose sleep over an incorrect date for a made-up holiday. Besides, if you can accept that today is Fortune Cookie Day, well, that gives me a good reason to now tell you two fortune cookie stories. The first concerns the publication of Math Jokes 4 Mathy Folks. About an hour after Bob Reed called to tell me that he’d like to publish my book, I was dining at a Chinese restaurant. The fortune in my cookie read: Your current plans will succeed. Though I am unwilling to ascribe the success of a book to a fortune cookie, the fortune appears to have been true. Since publication on August 9, 2010, more than 5,000 copies of MJ4MF have been sold. Though I am still holding out hope that it will sell a million copies, I cannot be disappointed in a book of math jokes that reaches 5,000 people. The second story involves my friend Andy Fielding. The day before he left for Africa to serve two years in the Peace Corps, he and I were dining at a Korean restaurant. After the meal, two fortune cookies were placed on the table. I told him to select one. “No, no, you first,” he insisted. “It’s okay,” he said as he showed me his fortune, which read: You are about to take a long and safe journey. Someday, I hope to open a Chinese restaurant. The portions will be very large, and the existence of leftovers is guaranteed by the Chinese Remainder theorem. You are a complex person, and i would like to be your friend. When life throws you a curve, calculate the slope of the tangent at the point of inflection. You will live a long life. If you marry an actuary, it will feel even longer. Your lucky number is the square root of 17. Fame and fortune will find you… unless you lock yourself in an attic, trying to prove the Riemann Hypothesis. Will you still need me, will you still feed me, when I’m 26? I have found an elegant proof of Fermat’s Last Theorem, but this fortune is too small to contain it. You are good at solving problems. Textbooks fear you. This cookie contains no fortune. Your students secretly agree that your head is not in proportion to your body. A foolish man will try to write a better fortune than this, but a mathematician will find it sufficient to know that a better fortune exists. When someone finds a counterexample to your proof, look for a different proof. A conclusion is your last thought before you got tired of thinking. You are so smart that you do not need answer keys. The fortune of this cookie is obvious. You are good at geometry. Q.E.D. Greet new friends with a handshake. At a math social, greet new friends with the handshake problem. Do not follow the instructions in this fortune cookie. Do not kiss a mathematician on the lips. Ever. Assuming that the sales rank of MJ4MF is always a five-digit number, what is the probability that three consecutive days’ sales ranks will contain a digit that occurs in the sales rank at least three times? The sales rank of MJ4MF has never been a five-digit number in which the same digit is repeated five times. (Bummer!) The probability of that occurrence, though, is even less likely than the situation described above — though I won’t tell you exactly how much less likely, so as not to spoil your fun! The sum of three consecutive integers is 27. What is the product of the integers? Today is August 9, 2010, also known as 8/9/10. It’s no coincidence that today was chosen as the official publication date for Math Jokes 4 Math Folks. You can preview the first chapter on the NCTM web site. You can also order a copy online at the following online retailers. Thanks to those of you who purchased a pre-publication copy. To those of you who buy a copy in the future — thanks in advance! Will you or someone you know be in Colorado Springs this weekend? So will I! I’m doing a book signing at Borders Southgate. Details below. Why is 6 afraid of 7? How many mathematicians does it take to screw in a light bulb? What type of lingerie does a mermaid wear to math class? Learn the answer to these and other questions at Borders Southgate on Saturday, June 26, when author Patrick Vennebush will talk about his book, Math Jokes 4 Mathy Folks. Are you aware that April is Math Awareness Month? And did you know that April is also National Humor Month? This is a great time for me to present the Math Joke Hour at the 2010 NCTM Annual Meeting in San Diego, April 21‑24. The Math Joke Hour will be held Wednesday, April 21, at 2:30pm in Room 6E of the San Diego Convention Center. Hope to see you there! It’s an even better time to buy Math Jokes 4 Mathy Folks! You can purchase it directly from Robert D. Reed Publishers; or, if you’re attending the NCTM Annual Meeting in San Diego, you can pick up a copy in the bookstore at a 25% discount.